The computer is one of the most complex artifacts ever built. Given its complexity, it can be described from many different points of view. 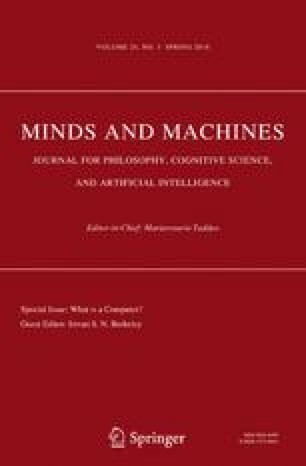 The aim of this paper is to investigate the representational structure and multifunctionality of a particular subset of computers, namely personal devices (PCs, laptops, smartphones, tablets) from a user-centred perspective. The paper also discusses the concept of “cognitive task”, as recently employed in some definitions of cognitive artifacts, and investigates the metaphysical properties of such artifacts. From a representational point of view, the article introduces the concepts of artifactual meta-representation and of semi-transparency, two features that personal devices share with some cognitive and non-cognitive artifacts. Recognising the meta-representational nature of personal devices and of other cognitive artifacts, thus overcoming semi-transparency, is important for the understanding of why different artifacts offer us different cognitive affordances as well as different cognitive advantages. In this sense, it is not simply a theoretical achievement, but has some important practical consequences. In our highly technological world we can use different kinds of computers and artifacts for solving the same tasks, and we need to understand why some artifacts are better suited for some tasks than others. The ultimate characterisation of personal devices that emerges from this work is that of a sort of super-artifact. This special status is given to personal devices because of their distinctive features. They are in fact intrinsically multifunctional and meta-representational artifacts, with extremely variable structures. As super-artifacts, personal devices are characterised by macro-functionality and can be easily used as both cognitive artifacts and tools for other functions, depending on the kind of representations they instantiate. Hilpinen, R. (2011). Artifact. In E. N. Zalta (Ed. ), The Stanford Encyclopedia of Philosophy (Winter 2011 Edition). https://plato.stanford.edu/archives/win2011/entries/artifact/. Accessed 15 Dec 2017.